Tapped features sparkly footage of bodies of water the world over, from oceans to rivers, lakes, ponds and streams. The sounds of burbling brooks and waterfalls throughout the film feel primal and urgent, as much a reminder of natures fragile beauty as they are a ticking clock, and the countdown is not in our favor. An opening salvo in the films first sequence sets the tone with a chilling statistic: by 2030, two thirds of the world will lack access to clean water. The film quickly segues into a scary question that is explored throughout the film; what happens if you take water, a requirement for life on earth, and turn it into a commodity, controlled by private corporations? Small communities all over the country have been subject to this process, and often dont know its happening until the corporations have already set up an operation. Communities in these situations have started organizing to stop the corporations from taking their water, but it is an uphill battle as corporations have teams of lawyers, lobbyists and other resources to advance their interests. In one small town in Maine profiled in the film, Nestle has set up a Poland Springs pump where it costs about six cents per gallon to pump water out of the ground. (A recent fight by Maine citizens, documented here and here has caused considerable headaches to Poland Springs.) The corporations then turn around and sell the water for $6.00 per gallon. This practice is happening in states around the country including California, Colorado, Arkansas and Michigan. The film points out that these corporations are setting a dangerous precedent that will allow them to control water sources in the future, which is why activists and concerned community members are desperately fighting to change the laws. Even citizens of Serbia, the birthplace of ScriptPhD.com editor Jovana Grbi?, are crying out against privatizing and selling its 300 natural springs, the most abundant in all of Europe, for water production. Act II of Tapped reveals the deleterious ecological and health fall-out from plastic bottles. Most of the bottles end up in a landfill or the Pacific Ocean. Often called “The World’s Largest Dump,” the Western Garbage Patch, located between Hawaii and California, is twice the size of Texas and largely composed of plastic. 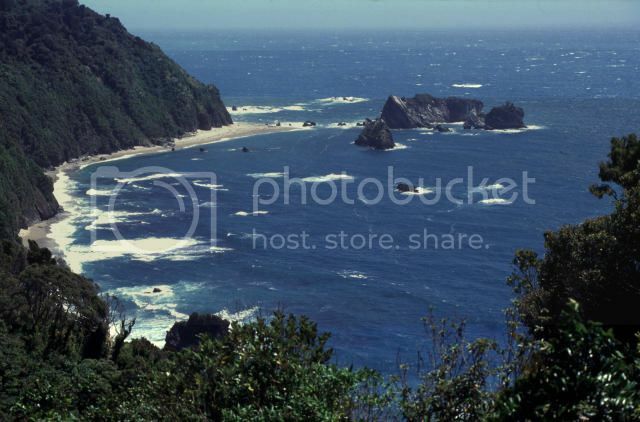 (An Eastern patch also exists, and video of it has been compiled here by the marine research group Algalita.) The film takes us to a bottling plant in Corpus Christi, Texas where local residents are dying from cancer due to the benzene emissions from the plant. They are often stuck living in a dangerous situation because no one wants to buy their home due to the close proximity to the plant. The film interviews several of these residents in one of the saddest moments of the documentary. One such interviewee, a man dying of cancer, says that were it not for the love of his family, he would feel like a piece of trash, his body the unwilling receptacle for toxic emissions from the faceless corporation making plastic bottles in his backyard. This man died shortly after the making of the film, and the film is dedicated to his memory. 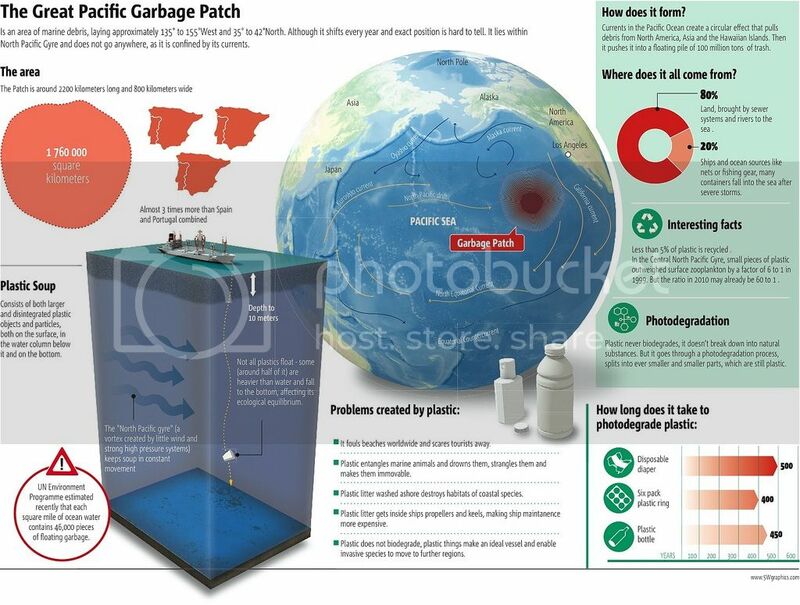 Infographic on the Great Pacific Garbage Patch, courtesy of www.5WGraphics.com. Click on the picture for a higher resolution image. About 40 minutes into the film there is a quick shot of a customer at Whole Foods placing his groceries on the conveyor belt at the cash register. The camera angle is low enough so we don’t see his face or the cashier’s face. We only see what he is buying; a sandwich, a bag of chips and a bottle of Smart Water. The image is a punch to the gut because that nameless, faceless scene has been me, too many times to count, and most likely it’s been you as well. The scene is a subtle reminder that every time we purchase a bottle of plastic water, weve voted yes for a system that is killing poor families in Corpus Christi (and elsewhere) and littering beaches in Hawaii with such large amounts of plastic that an army of dump trucks couldnt clean it up. Even more insidious is the amount of microscopic plastic particles floating around in oceans from thrown-away plastic bottles. When one activist scoops up a handful of sand from a Hawaii beach, it looks like he’s holding a fistful of pulverized Lego’s; the plastic particles quickly replacing the sand particles. This is a result of what happens when people don’t recycle their bottles. Bottles left on the street are picked up by rainwater and washed into rivers and stream, and ultimately end up in the oceans. But recycling bottles is not exactly an entirely sustainable solution either, as the film points out. Municipalities who produce tap water, and who are in direct competition with bottled water, are often left holding the tab to recycle the leftover plastic bottles from their competitors, but with only a fraction of the budget that the corporations have. A more worrisome horror of plastic bottles is an insidious chemical called bisphenol A (BPA), used to make the hard, clear 5-gallon kind bottles most often found at a water cooler. Frederick Vom Saal, PhD at the University of Missouri, Columbia is a leading expert on BPA and its effects on human health. He calls it one of the most potent, toxic chemicals known to man because even in small amounts, it profoundly disrupts every single part of the developing male reproductive systems in lab animal studies, even at doses 25,000 smaller than any dose that has ever been studied. In larger doses, it disrupts the thyroid gland, and its been linked to a plethora of diseases from cancer to obesity, diabetes, and attention deficit and hyperactivity disorder. A recent study even found a link between BPA exposure and permanent fertility effects. These diseases have been killing people at increasingly higher rates over the last 30 years, a direct correlation to the amount of BPA floating around in consumer products over the same period of time. The FDA has not closely regulated BPA and for a long period of time, as the film reveals, relied on studies from bottle manufacturers (the people who make bottles out of BPA for a living!) that state BPA is not dangerous in small quantities. The Huffington Post recently published a series of articles revealing that BPA is found in cash register receipt paper and cardboard pizza boxes, among a host of other everyday items. In a particularly effective scene from the film, filmmaker Stephanie Soechtig boldly asks an FDA official about their role in regulating BPA. A furious FDA press official abruptly interrupts the interview from off screen and states that if he knew BPA would be discussed, he wouldnt have allowed the interview. The failure of the FDA to protect the public from a chemical as dangerous as BPA could be the last straw in the publics tolerance for government incompetence and corruption, which explains why the FDA doesnt want to discuss such a volatile subject. BPA is found in a whole host of consumer products including dental fillings, canned foods, food wrappers, food labels, and baby bottles. The good news is that due to mounting public and scientific pressure, the FDA is conducting a new study on the safety of BPA, but the $7-billion-a-year BPA industry will surely put up a fight to stop any regulation. To protect your own health, the films website says you should look for BPA Free labels whenever you buy hard plastic and avoid eating canned foods or drinking from hard plastic water bottles. The soft plastic water bottles that most of us drink from do not contain BPA, but that doesnt mean they are safe. As one expert in the film says, we dont know the long term effects of drinking from PET plastic bottles. A recent British study showed that pregnant women exposed to phthalates, common across all plastics, gave birth to babies with gender defects. And in a particularly disturbing sequence from the film, the crew of Tapped buys their own samples of bottled water and sends them to toxicology labs for testing. Due to the large marketing and advertising budgets of bottled water makers, we have been led to believe for a long time that bottled water is safer than tap water. But the list of chemicals found in the bottled water, including styrene, dimethyl phthalate, and di-n-octyl phthalate, shatters that notion. Tapped ends on a hopeful note, reminding us that change is possible, and highlighting the various battles that water activists and concerned citizens have won in recent years along with some tips for the consumer to drink filtered tap water from a reusable water container and to urge leaders to invest in our municipal water infrastructure. The Mayor of San Francisco banned bottled water at any municipal or government location. Seattle banned sales altogether at city events. Perhaps change is in effect. News outlets reported late last year that bottled water sales are starting to slump for the first time. Look for Part II of this article containing an exclusive ScriptPhD.com Q&A between CaptainPlanet and filmmaker Stephanie Soechtig in the coming week as we continue to explore conservation issues and what can be done to enact positive change. Tapped is slated for official DVD release (with bonus features) May 1. Visit their store to purchase the DVD and Kleen Kanteen PBA-free water bottles. This is a great article which covers myriad of important issues. The battle for water drilling rights described above reminds me of China and Tibet. I saw a documentary recently which drew attention to an often overlooked fact regarding Tibet. Many people wonder why China is so hungry to control Tibet, after all it isn’t the most fertile land in the world, nor the most livable. If one wants part of the answer, take a look at where Tibet sits on the map and its geography. If you were China, wouldn’t you want access and control to perhaps the biggest region which supplies water to your country and India too? CBS’s 60mins did a show on bottled water before bottled water was the rage. They asked people why they loved the water, people relied “it’s better tasting than the local water” The water’s source was in fact the city water. @NeuroScribe: Thanks for the comments. Over the past year I bought some reusable glass water bottles and fill them up with filtered tap water. I’m trying to get to a plastic-free “diet” to keep it out of my body and out of the environment. Thanks for this write-up on World Water Day. Definitely the best I’ve seen. Thanks for taking the time to write this piece. I was totally unaware of the health dangers involved in drinking out of plastic water bottles, not to mention the negative effect “water mining” has on communities. “The truth will set you free,” – keep it coming! BTW, none of the images showed up on the page for me 🙁 maybe my DNS provider is blocking them. Also, just a couple of typos: paragraph before “BPA: Dangerous Chemistry” – Corpus Christi (no “e” at the end); and the first paragraph of the BPA section – does = dose. I’ll be sharing this with everyone! @Brother Franics Therese: Thanks for the feedback. We fixed the typos this morning! Are the images showing up yet on your side?